thanks, I didn't see that table when searching. It looks lik BBR's 2006 crusted (still produced by Dow) has just been released. Yes - anyone seen a 2005 Dow? - did they skip a year?? Sainsbury are now stocking the Graham 2006 crusted - currently available at £12+flumpence with 25% off if you buy 6. 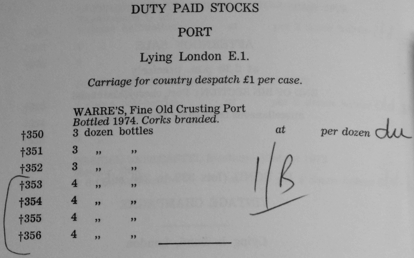 And still new crusteds emerge from the past..
Have just taken delivery of two Warre '80, and have spied a stash of Martinez '73 coming to auction..
uncle tom wrote: have spied a stash of Martinez '73 coming to auction.. I noticed these. Are you going to that particular auction? May bid online, but am fairly easy about these, so will not bid very aggressively on my own account for the whole stash. If anyone wants a share (I think there's eight bottles) please PM me to let me know how many bottles you'd like, and how much you'd like to run to; and I'll work out a collective bid position. Tom if you win these and are willing to part with one or more let me know. 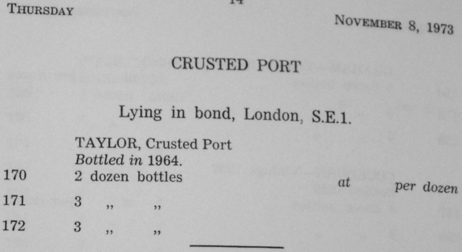 1973 is my birthyear and as you know it's not a great year for port. I'd love to finally try a port from this year. There's been an email discussion circular about this sale already - PM me your email address, and I'll forward it to you..
• Lots 119 to 125 totalling 20¾ “Dozens of Port, Graham’s Blend of Vintages, bottled 1882”, sold at 13/- and 15/- and 14/- per dozen. 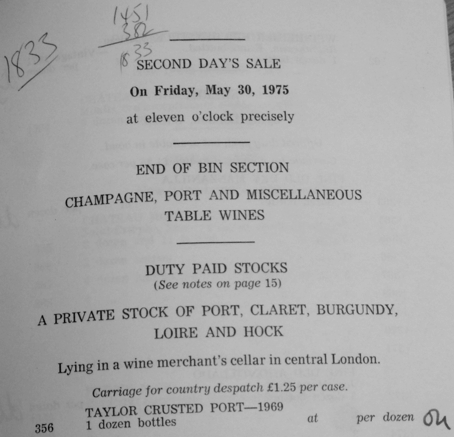 Messrs. Christie, Manson & Woods, on 7 May 1894, sold “The Cellar of Wines And About 6000 Cigars, The Property Of John Graham, Esq., Deceased, late of 18 Albert Gate, S. W.”. Lots 81 and 82 totalled 5 “Dozens of Blended Port, Graham, 2/3 1844, 1/3 1840, bottled in Oporto, 1846 Bin 23” at 80/- and 81/- per dozen. 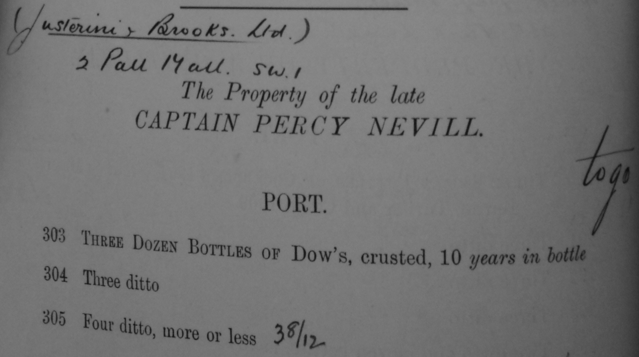 Lot 83 was “Four Dozens of Blended Port, Graham, 2/3 1840, 1/3 1844, bottled in Oporto 1847, more or less”, the quantity corrected in hand to 3 dozen and 6 bottles, and sold at 94/- per dozen. Which sounds incredibly cheap, until you reckon it against average earnings, then and now. 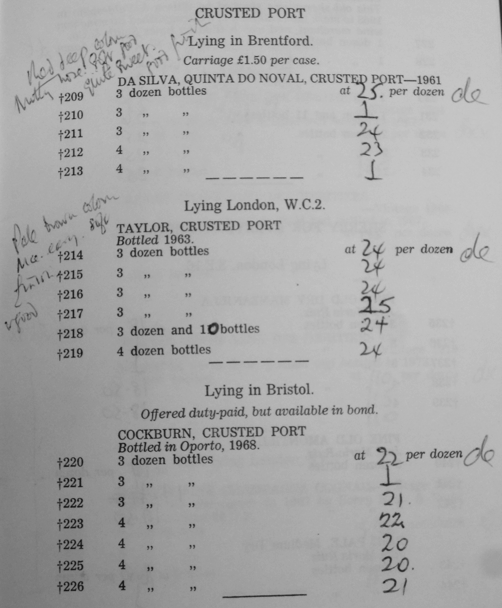 The UKs average income has risen approximately 500 fold since the 1890s, which makes this price equate to around £200/btl..
Christie’s, 6th July 1931: “Dow’s, crusted, 10 years in bottle”, sold at 48/- and 44/- per dozen. Auction, Christie, Manson & Woods, 16 October 1973. Auction, Christie, Manson & Woods, 8 November 1973. Auction, Christie, Manson & Woods, 14 March 1974. Auction, Christie, Manson & Woods, 7 November 1974. Auction, Christie, Manson & Woods, 14 November 1974. Auction, Christie, Manson & Woods, 20 February 1975. Auction, Christie, Manson & Woods, 30 May 1975. Auction, Christie, Manson & Woods, 26 June 1975. Auction, Christie, Manson & Woods, 12 February 1976. Auction, Christie, Manson & Woods, 14 July 1977. Auction, Christie, Manson & Woods, 13 September 1977.